In 1972, some Centennial High School youth in the City of Compton from Piru Street fought Crip gang members who were expanding throughout South Central Los Angeles, CA at the time. The Pirus beat the feared Crips that day. In their honor ever since, Black gang members from Compton who were not Crips referred to themselves as Pirus. Other Black gangs (many of whom were already in existence for years) outside of Compton who did not become aligned with the Crips, became known as Bloods. Today, there are some Piru gangs located outside of Compton, but they usually trace their roots to the Original Pirus of Compton. 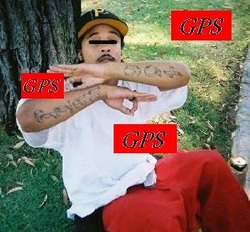 Also, it is not uncommon today for local Piru and Blood gangs to have little to no real connection to L.A. based gangs. Bloods and Pirus will usually wear red, but not always, for instance Limehood Pirus are known to wear green. The "United Blood Nation" was founded in the early 1980's in California and not at Riker's Island Prison in New York as some authorities have noted. There were some Black gang members on the East Coast who in 1993 took the original UBN idea, reformatted it as their own, and created their own version of this prison gang of Bloods. There is also another prison gang called "United Blood Line", sometimes referred to as "United Blood Love", or "United Blood Life" on the East Coast. While East Coast Bloods may use the number "31", these codes have little meaning on the West Coast. Sometimes, Bloods will address each other as "Damu", Swahili for "blood". These groups are constantly evolving as they move around the U.S. Bloods/Pirus are active in Seattle and Tacoma, WA, as well as other cities in Washington State.